BEACHWOOD, Ohio (August 20, 2018) – Tremco Roofing and Building Maintenance has added two tough, waterproof, easy-to-install single ply roofing systems to its TremPly® line: TremPly KEE and KEE FB (Fleeceback). 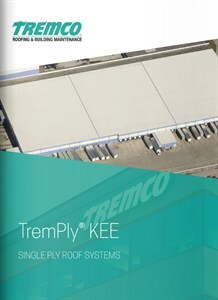 TremPly KEE and TremPly KEE FB single ply roofing systems are available in mechanically attached or fully adhered configurations, with seams fused with conventional hot air welding. They come in 45 mil and 60 mil thicknesses with a highly reflective standard white surface which could help lower energy use; tan and gray are also available, and all colors can help a business meet LEED requirements. Both systems carry extensive FM Global and Underwriters Laboratories approvals. They are available in conventional 74” or 100” wide by 100’ long rolls; customized, prefabricated roll widths and lengths are also available.